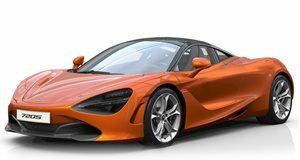 Chris Harris is a big fan of the standard McLaren 720S and believes it is the most complete supercar on sale today. He is, however, far less charitable towards the Senna, a car designed for the track but far less visually appealing and less useful everywhere else. So, what does he make of the 720S when it has the Track Pack fitted? In a nutshell, the Pack includes a set of forged wheels, a titanium roll-cage and, on this car, a whole lot more carbon-fiber trim. Straight away Chris is impressed with the sheer speed of the thing, it turns and corners with great precision which he demonstrates to good effect in smoky slides around every corner. He compliments the steering feel and how it manages to offer both a firm ride on the track and still be supple and comfortable on the road. Less impressive is the build quality which he feels could do with some improvement, but that is (almost) the only thing he can fault on this 710 horsepower supercar. With rivals like the Ferrari F8 Tributo having recently being revealed, its dominance may be under threat but the 720S does come with some very advanced tech and features like the full carbon-fiber bodyshell and cross-linked hydraulic suspension. In summary, then, the 720S Track Pack builds on an already fantastic supercar and enhances its on-track experience without significantly detracting from its on-road usability. There is the small matter of the additional cost of all these enhancements, at £28,360 ($37,000) for the Track Pack bits and about as much again for the cosmetic carbon-fiber add-ons, the McLaren Chris tested was a full $73,000 more than the standard car. Chris’ recommendation? Buy a nearly-new standard 720S and have almost as much fun for a whole lot less.